Time to discuss the whirlwind extended weekend that is Miami Carnival or as I like to call it, “The Caribbean Reunion” because I get to see so many of my friends from everywhere… all at once. We normally arrive Thursday evening, but this year I decided that I wanted to arrive earlier in the day and attend the Trini Jungle Juice fete called “Arrivals” in Coral Gables, FL. It was a good call cause that was a darn good fete. Even though a lot of friends didn’t arrive until later in the weekend there was plenty familiar faces in di place. The fete was 3pm-11pm, we arrived around 7pm and there was a crazy long line outside. Thank goodness the homie Jermaine was already in line & summoned us over towards the middle, we still had to wait about 30min to enter. I think the problem with having such a lengthy fete timeframe is you already know how Caribbean people operate, they are going to arrive towards the end, so the fete was just starting to get nice when we got there. The drinks were apparently wicked expensive, although that really doesn’t affect me because I am innovative (lol). When I was waiting to order a coke, the guy in front of me ordered 4 drinks and handed the bartender a $40… teeheehee the bartender was like, “No $68!” the look of the guyz face was priceless. Overall the vybz were niiiiice, the DJs were awesome (Private Ryan, Crown Prince, Dei Musicale, etc), and the fete was well worth the $40. After Arrivals it was a quick change of clothes and then off to Tribe Ignite at Solare Gardens in Doral, FL. This fete was kinda far away for us, but fete distance is relative to your lodging location and we were in Downtown Miami/Biscayne. There were lots of people standing around outside Ignite, which reminded me of my 1st time attending. We didn’t have tix our first year, stood around for about an hour and ended up buying overpriced tix from scalpers, but it was worth it cause we had a blast. There was no line this year and we breezed inside and straight to the bar. I didn’t like that they were working off the drink ticket (chips) system where you had to go to a 2nd line and buy a minimum of $20 worth of tickets. I am NOT going to need $20 worth of Coke, but between me and the homies, we worked it out. The bathrooms at Solare tend to be decent at the beginning of carnival weekend, but I was still traumatized from the fete I attended at Solare at the end of the carnival weekend a few years ago and I opted to pee in the bushes after the fete. *Don’t Judge Me* Thursday night was a darn good time, had much more fun than I had at the Thursday fete I attended 2014. We started off Friday morning with a bottomless mimosa fete on the patio of our condo. Our condo is along a boating dock and we saw feter’z lining up to attend a boat ride. I think I would like to attend a morning boat ride next year, if you read my Miami 2012 MIA carnival blog you know that night time boat rides are a no no for me. Early afternoon it was off to Rise / Shine at Key Biscayne beach, one of my carnival favorites. 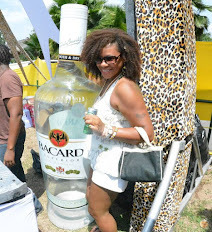 We like to go the VIP route at this fete because we almost died of a heat stroke our very first year. Now we lounge in the shade of the VIP area enjoying a lite midday snack and an open bar. They were kinda stingy with the open bar this year, they would give you a cup full of chaser and top it off with a lil alcohol. *NOTE TO PROMOTERS* if you make the drinks strong, we will get drunk sooner and come back less. VIP had its own bathrooms so you don’t really need to venture into “General Population” unless you want to, but we don’t. #STUSH? We did manage to eventually maneuver our way to drunkenness and as always had a good time. Friday afternoon/evening is usually spent picking up our costumes, but our homie Lisa was a rock star and picked em up for us #WINNING. Lisa is getting married soon so a few of us chicas attended a small bachelorette shindig for her Friday evening and partook in plenty free booze and food *whoop whoop* Guess we are getting old cause we weren’t even inclined to hit the town afterwards, we went to bed so that we would be well rested for Jouvert morning (actually I stayed up till around 2am altering my costume). We had another bottomless mimosa breakfast Saturday morning to help us get ready for the Jouvert madness to come. The great thing about playing mas with One Island band is that you get Jouvert free (tshirt, entry, 5 drinks, snack). The average Jouvert band charges $75-$100 (although that includes unlimited booze). If I wasn’t with One Island I would just pay my $25 to get in, sneak my booze (it can be done if you try hard), and storm the bands. I love love love Jouvert, even more than road marches. Everyone gets all wacked out off the booze & vybz and turns into paint & powder covered jumbies. Some members of the crew acquired large flags and were in a trance with their flags most of the afternoon. Lol Thank god for the long drive back from Jouvert, that nap saved our lives *kudos to the driver cause I was IN AH MESS*. Quick change of clothes and off to Soca Brainwash hosted by none other than DJ Private Ryan. If I had to name 1 fete that you should NOT miss carnival weekend, this would be it. You had to be on your toes to snag these tickets cause they went QUICK the 3 times tickets were released. Once again, people rolled in late cause that’s how Caribbeans roll, but eventually the event was packed & the Vybz were sick. They gave you a cool cup upon entry although it was kinda too big cause you would need to buy like 2 ½ drinks to fill it. Once again they were on that darn drink ticket (chip) system, but they only had a $10 minimum this time *I can dig it* . The 2 lines to get drink tickets were ridiculous *le sigh* but they quickly helped the drunkards out by opening a 3rd line *thanks Ryan* This is the fete where we saw all the other people that we hadn’t seen all weekend and you know when a lot of good friends get together, a good time is guaranteed!!! Best fete of the weekend, nonstop dancing, I'm sure I lost about 5 lbs. We were once again not inclined to head out Saturday night and were in bed by midnight. Don’t judge us, it was a long drunken day. I just want to start off by saying that Carnival Sunday was a hot mess!!! We started off the morning with yet another bottomless mimosa breakfast (we were on a serious champagne campaign this weekend). The traffic outside of carnival was ridiculous, it took us 1 hour to move just 3 miles. Definitely gotta leave earlier next year to account for traffic. It was cool that parking was free, we used to pay $20 at the old location. The road (for the road march) seemed too tiny this year, not wide enough, felt very congested at times. The claustrophobic moments didn’t take away from the awesome, crazy vybz. Shout out to One Island Mas Band for always providing a darn good time. Our crew was on the road for 6 hours and lemme tell you those 6 hours FLEW BY. Kudos to all those people that are on the road for 8-10 hours #Soldiers. I must say, it’s always weird being on the road in Miami with almost no bystanders, no kids to pass the love of carnival onto. You like how I threw a Panama tassel in the rental? There were lots of casualties at carnival: lost Paco most of the day, Paco and another friend lost their cameras, I lost my cell phone, and one of our crew members lost herself! M.I.A. in Miami. Lemme explain… she was in another band, let a friend borrow her phone and proceeded to lose the person holding her phone. She spent the entire day looking for us and the person with her phone. When she finally found us she was quite traumatized and needed to be consoled. Were all in bed by 11pm like wholesome old people, no after partyz for us. I went online to suspend my lost phone and found out that I had the ability to track my phone, technology sure is amazing. Sadly I was too intoxicated and too tired to make the long drive back to carnival to retrieve my phone from the location on the map. I tried tracking the phone when I woke up in the morning, but someone found it and turned it off (we will discuss more about them later). In previous years we would attend some fetes on Monday or even stay till Tuesday, but this year Monday was dedicated to chillaxing on the beach with some Fat Tuesday (my favorite), Mr. Bose, and friends. Monday was a pretty cheap and relaxing day, we had dinner at Hooters and then most of us headed home that night and returned to life as usual. If you travel to carnival with a group of friends I would recommend getting condo vs multiple hotel rooms. Its so much more fun and maybe that’s why we weren’t pressed to attend as many parties. We had mini parties in our place morning, noon, and night. We cooked each other meals, spent hours on the balcony drinking, playing music, and enjoying each other’s company. OR maybe we are just frekkin old???? So remember that phone I lost? It sent me a notification 4 days after carnival letting me know that it is now near Washington, DC and gave me the exact address. Soooooo I wrote that person a letter (and sent a letter to the house next door incase the address a little off) included a print off of the information below, just asking them to please take my phone to their nearest Tmobile location. Will they do it? Probably not, but I had a lot of person info on that phone and silly silly me never locked my phone. So if my identify gets stolen, I'm heading to DC. And of course I leave you with a recap video. CHOW!